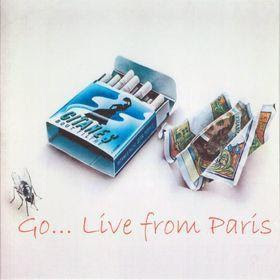 The primary difference when comparing this live performance and the rendering simply titled Go (1976) is that Go Live From Paris (1978) presents the proceedings (as they exist) in a properly linear fashion, as correlated to the Eastern mythology that informed the extended two-part suite. This is in direct contrast to Go, which assembled the contents out of sequence. The stage show was recorded at the Palais Des Sports in Paris, France on June 12, 1976 and the recital setting allows for considerably longer and more exploratory interaction amongst Stomu Yamashta (percussion/piano), Steve Winwood (vocals/keyboards) and Michael Shrieve (drums). They are joined by legendary jazz axeman Al DiMeola (guitar) as well as Tangerine Dream and Ash Ra Tempel veteran Klaus Schulze (synthesizer) -- all of whom had contributed to Go. Filling out the band are Jerome Rimson (bass), Pat Thrall (guitar), Brother James (congas) and Karen Friedman (vocals). In terms of sheer intensity, it is hard to beat DiMeola's searing leads and Winwood's blue-eyed soul on the driving "Ghost Machine," easily topping its former incarnation. "Surfspin" lands into the funky mid-tempo "Time Is Here" highlighted by Karen Friedman's expressive exchanges with Winwood, while Rimson punctuates the rhythm with some penetrating bass interjections. This is followed by the sole Winwood composition "Winner/Loser," which further exemplifies how the spontaneity of the concert yields results that best their predecessors. In fact, on the whole the material on Go sounds like a blueprint for the exceptional and inspired outing found here. The second movement commences with fairly even renditions of the trifecta "Solitude," "Nature" and "Air Voice" -- which had previously been given the name "Air Over." "Crossing the Line" is an additional zenith, spotlighted by Winwood's emotive vocals and the untamed and otherwise incendiary frenzy of fretwork courtesy of DiMeola. Clocking in just shy of a quarter-hour, "Man of Leo" provides another opportunity for the players to loosen up and fuse their collective improvisations behind DiMeola's intense soloing and the similarly seminal instrumental offerings from Shrieve, Rimson -- who is at his most melodic -- and Freidman's haunting warbles. In 2004, Hip-O Select compiled both Go and the companion Go Live From Paris (1977) on to a limited-edition (of 2,500 copies) two-CD set remastered by Gavin Lurssen and includes all of the original notations, lyrics and artwork within a 16-page liner booklet. wow- always liked the studio version- looking forward to this! Thanks! Stevie Winwood added so much to this especially "Crossing the Line." Thank You. a winwood classic...musicians used to be so much more creative back in those days...enjoy!